I visited the 8550 foot (2606 m) summit of Mt. Bigelow, Arizona in October of 2005, and I observed this beautiful, green metallic beetle, an Acmaeodera resplendens, perched on a well-chewed, yellow daisy just below the summit. The beetle was a bright emerald green in the sunlight, but it appeared to be more of a sparkling blue-green color in my photographs. This resplendent beetle is a member of the Metallic Wood Borer Family (Buprestidae), which are also known as Jewel Beetles or Buprestids. It was very windy at the summit, and I had a great deal of difficulty getting a picture of this lovely, female beetle because her flower kept bobbing around wildly. When I held onto the flower to steady it, the beetle crawled onto my hand and did not seem to want to leave. The weather was cool, but my hand was warm and the beetle happily pressed herself against my skin. After she had warmed herself for a bit, she flew off to another well-chewed daisy. 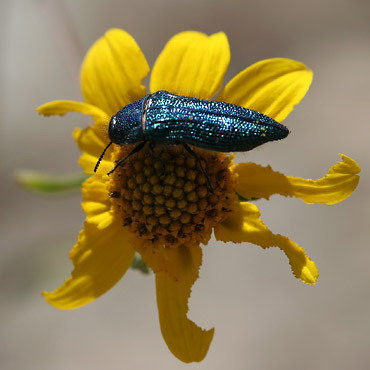 The beautiful, green metallic beetle was soon joined on her flower by another species of Jewel Beetle, a Yellow-marked Buprestid (Acmaeodera decipiens). After I observed them begin mating, I was easily able to determine that the green beetle was a female and that the black and yellow one was a male. 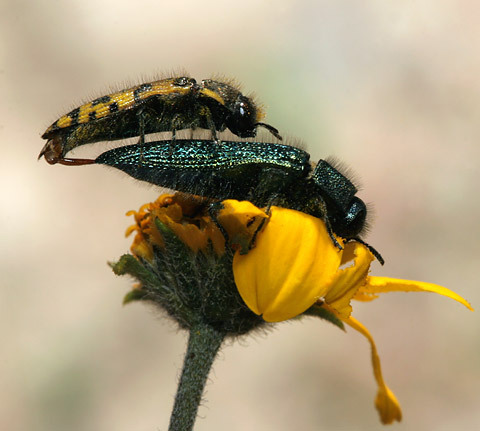 I had initially thought that their mating meant that they were the same species despite their different coloration, but entomologist Joseph Cicero, PhD informed me that these were actually two different species of Jewel Beetle mating. I did not know that this could occur, and I wonder if viable offspring could result… And I wonder what they would look like if they did.